Corrupted Crystal: Add Dark Side point when using a Force Power while wielding. Mental Fortress Spend 1 Destiny Point to ignore effects of Critical Injuries on Intellect and Cunning checks until end of encounter. Shien Technique When making a check using Lightsaber skill, the character may use Cunning instead of Brawn. Dodge When targeted by combat check, perform Dodge incidental to suffer number of strain no greater than ranks in Dodge, upgrade difficulty. Conditioned Remove setback from Athletics and Coordination check. Reduce the damage suffered from falling by 1 per rank of Conditioned. Parry (Rank 2) When hit by a melee attack, suffer 3 strain to reduce damage by 2 plus ranks in Parry..
Counterstrike When an attack misses the character and generates a Despair or two Threat may upgrade next Lightsaber (Cunning) check against attacker during encounter once. Defensive Stance Once per round, may perform Defensive Stance maneuver and suffer a number of strain to upgrade difficulty of all incoming melee attacks by an equal number for the next round. Strain suffered this way cannot exceed ranks in Defensive Stance. Sleight of Mind Boost to Stealth checks. User may spend Force Die to sense all living things within short range. User may spend Force Die to sense the current emotional state of engaged target. Strength Upgrade twice instead of once. Control Ongoing effect. Commit Force Die once per round, when an attack targets the Force user, he upgrades the difficulty of the pool once. 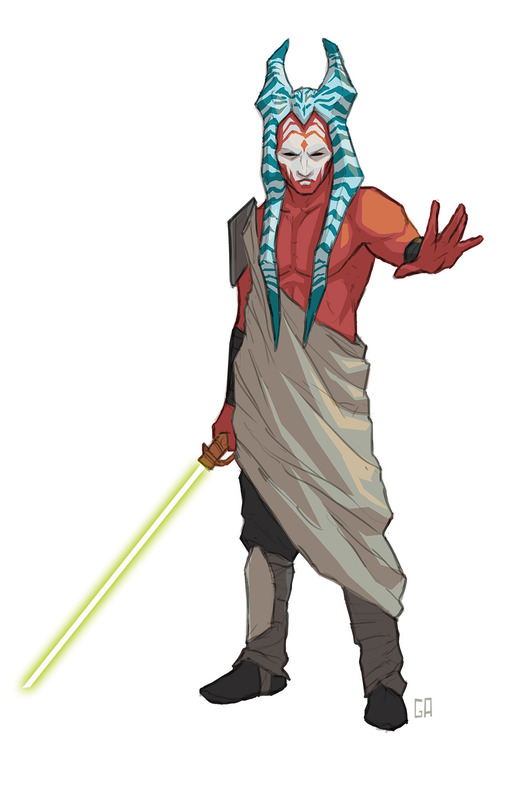 It was during his time in the Jedi Order that Yornaroth found his preference for the Shien technique. While others sought to commune with the Force during their training, this Togruta spent a lot of his time learning to not rely on it as much. During the Clone Wars, Yornaroth and his master spent barely any time in any large scaled battles. They barely spent any time working alongside the clonetroopers of the Republic. They worked with local resistances and criminal elements opposed to the Separatists, acting as guerrilla fighters rather than generals. Prestige or rank was never a motivation for Yornaroth, merely proving his worth and getting the task at hand done. Then, Order 66 came. Yornaroth and his master were surprised to find the clonetroopers they had fought alongside a handful of times now hunting them down. It became a game of cat and mouse along outer rim worlds, but during a skirmish on Dathomir his Yornaroth's master was killed. Fear drove him to hide, to wait for the clonetroopers to show weakness. He hid in the ruins of the Nightsister's settlement and drew the soldiers in. Systematically eliminating his pursuers one by one, he let his simmering hatred express itself in the warnings he left for those that tried to approach his lair. Over a period of time, the ruins and the events of the past began to twist his mind until finally he succumbed to the dark side. During his meditation he couldn't focus, during his sleep he was tormented with scenes of the deaths of the Nightsisters, the horrors inflicted on them began to seep into his very being. Finally, when the Grand Inquisitor arrived at his doorstep after hearing the rumors of the 'Wraith of Dathomir,' he saw not another Jedi to hunt. He saw another to add to the ranks of the Inquisitorious. As a member of the Inquisitorius, Yornaroth fell quickly in line with the order and its mission to hunt down the surviving Jedi. As the number of Jedi survivors began to dwindle, Yornaroth began to fear being labeled as expendable and have his usefulness run out. Hunting down rebels alongside the remaining Jedi, Yornaroth seeks to validate his usefulness to the Empire and Darth Vader as a whole.